There is no need to state the importance of Skype and it is annoying to guess if someone has blocked you because you receive no reply from them. But don’t know worry about this anymore. The article gathers the tips to confirm if you have been blocked. Go on and find what they can help. And note that even your use the latest iPhone 8/X and iOS 11.3, these methods work, also. Go to Skype on your iPhone and log in. Open your contact list and locate the icon beside the person who you think has blocked you. If the icon turns to a gray question mark from the gray "x" icon or green check mark, then the person doesn’t share his/her information with you. And this is s strong sign that you have been blocked. Start a new chat window and send a message to the person you think has blocked you. If you cannot be able to see any conversations between you and him/her and the message is returned as undeliverable or is shown as processing indefinitely, then unfortunately you've been blocked by the person. 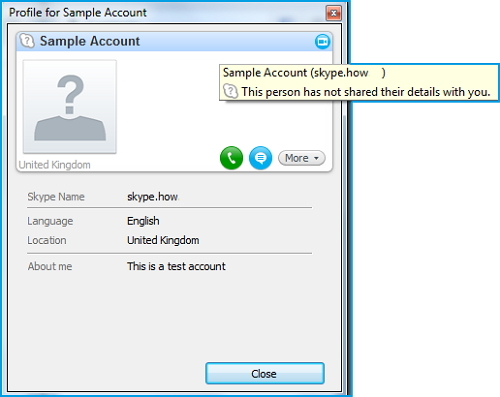 If you cannot see the personalized profile picture of the person who may block you, but what you can see is the default "Skype" avatar – well, the person stops sharing personal information with you and it is very likely that you have been blocked. You can observe your friend’s status and see whether there is any abnormity and then judge whether he/she blocked you. A sudden change in your frequency of communication with your friend, a recent argument or fallout, you just haven’t hear from the friend…These are all bad signs. Just combine these signs and with other tips in Skype, you can easily and clearly decide whether you friend has blocked you. Before operate, just confirm you have Skype voicemail. And go to your contact list and find the one you doubt. Right click the contact name and choose "Send Voicemail" and try to send to him/her. If it fails to send, then you have been blocked by that contact. You cannot see the profile picture and the number of contact to confirm whether you have been blocked. If you are just blocked you’d still see both. If you are just deleted you’d still see the picture. But no picture and number? Well, you’d have been deleted and blocked. Sometimes you can ask for help from a mutual friend. You can also see the mood message last used by the person who has blocked you, but you cannot see the moods they enter after blocking you. You can check his/her mood message from a mutual friend’s phone. If it is different with the one on your phone, then you are blocked. You can also find out the answer by the following steps. It maybe a little complicated but it works 100%. Sign out of Skype on your computer. Find the Skype file located in the appdata which is in the directory on your computer: OS ( C: )/ users/ Your User Name/appdata/Roaming/. Copy that Skype file to your desktop as a backup. Once done copying, delete the Skype file in OS ( C: )/ users/ Your User Name/appdata/Roaming/. Sign back into Skype you and have done a complete clean. Look for the suspects with missing photos, if those photos were missing already but you can see their contact list they are safe. Check the profiles to find the online status circle below the star, if it says “this person has not shared his/her contact info with you” that means you been blocked by that person.